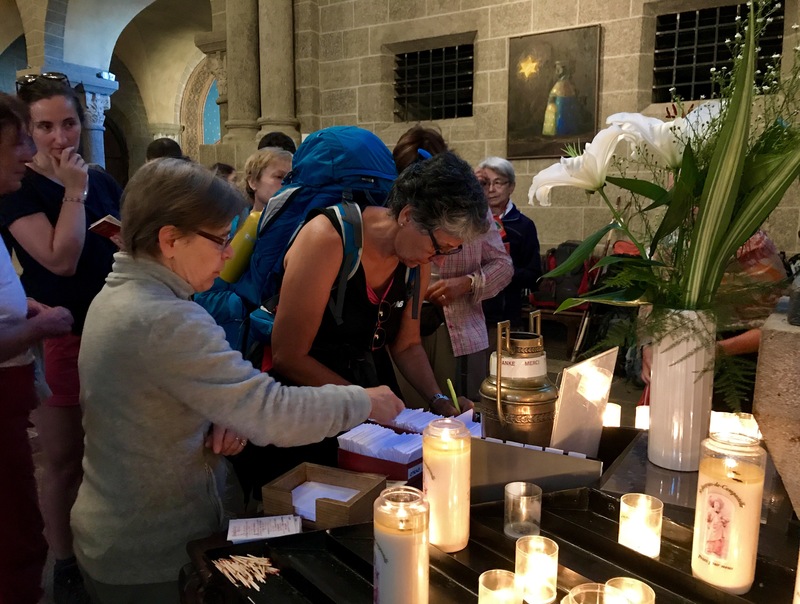 In Le Puy-en-Velay, pilgrims are encouraged to begin their journey by attending a pilgrim mass that is offered daily at 7 a.m. Many attend whether they are religious or not. I won’t miss these stairs, but the view is worth it! 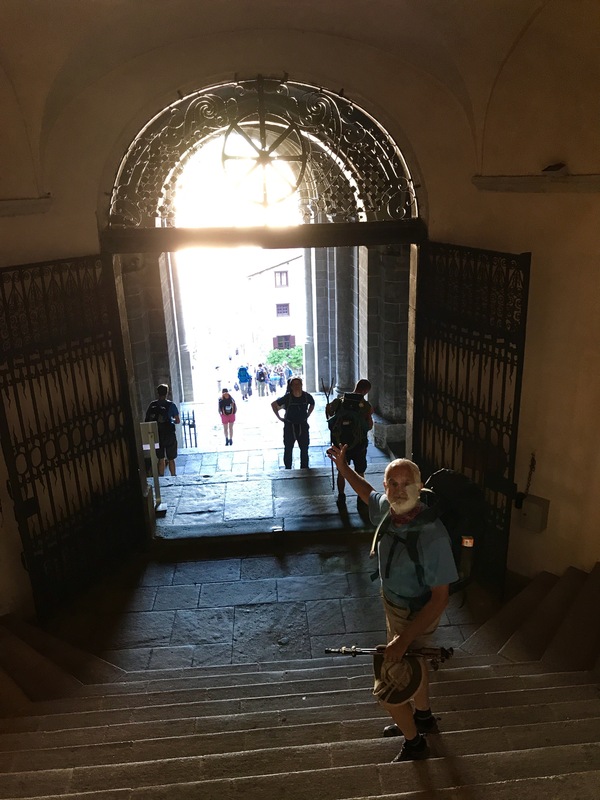 I climbed the steps to the cathedral at 6:50 a.m. greeted by a smiling David. Fifteen pilgrims sat on the stairs before the large, closed front doors. David and I traded stories of how we slept and as the clock chimed 7, a German woman checked the front door to find it locked. I went around to a side door and found it open. The mass had already started and there were about 50 people present. Backpacks lined the walls of the nave. I had no idea how these people got in. But I slid my backpack off and placed it and my sticks against the wall, then quietly found a seat. David did the same and came to stand next to me. Other pilgrims entered in the same fashion over the next fifteen minutes. The mass proceeded as it has since my childhood — except that the whole thing was in French. Well, almost the whole thing. The first time I heard the priest speak English was just before Communion — to explain to us that if we were not Catholic, we were not allowed to partake. I can’t imagine Jesus telling some of the people gathered with him that they weren’t allowed to dine with him, but that’s another story. (To those of you that are Catholic, I understand why. I just can’t reconcile it.) When this announcement was made in the cathedral in Santiago at the end of my first Camino, I walked out. Over the course of the next year I went into a church twice: once for a wedding and once for a baptism. And I noticed something: I no longer took offense to the way things were done. I now had a distance from it all and was able to see it as just “the way some people see things.” Just like observing how another culture operates when I visit a foreign country, I watched, interested, wondering, but now lacking the judgement, frustration, anger. So in Le Puy-en-Velay, the announcement still stung, but I let it go. The second time the priest spoke English was at the end of the Mass. He invited all of the pilgrims present to gather in a place near the altar where he would offer a benediction. Seventy-five people gathered around him and a small table beside him. First, he asked where people were from. The first person who spoke said, “United States.” He then asked everyone from the US to raise their hands. There were five of us. Next, the French. The majority of people raised their hands. There were also people from Belgium, England, the French island of Reunion, and a few others. After being sure he mentioned everyone’s country of origin, he held up a small book that was on the table beside him: the gospel of Luke. “It’s in French,” he told the English speakers, “so maybe you use it to help improve your French,” he said with a smile. There were white plastic rosaries enclosed in plastic along with a booklet about how to pray the rosary. “Also in French,” he told the English speakers. “But this time there are pictures,” he said, with another smile. And finally he offered a small booklet listing places to pray along the way. And by this he meant churches and chapels, because, now that I think about it, I’m sure he’d agree with my thought that you can actually pray anywhere you’d like. Next the priest lifted a small box from the table. Inside, he explained, were blank pieces of paper and a pen. He invited us to write what we were praying for on this Camino, and put it in a slot behind him. He then held up a second, longer box filled with folded papers. “These,” he explained, “are all the prayers of those pilgrims who were present for this mass over the last few days.” He offered that we could take one with us. Read it. Pray for that person. “This box,” he said, indicating the one in his hand, “are the ones in French. And this one,” he said, putting down the French prayers and picking up a smaller box, “are the ones in other languages.” I took one from the “other languages” box. It was in English. A long paragraph from an American now living in France. I put it in my pocket. Writing a prayer, and taking the prayer of another. “Now, the blessing,” he said. He handed out small cards that contained a prayer for the pilgrims. He had it in at least six different languages. Once the foreigners had their copies, he said the prayer. He then moved us all directly in front of the altar. A woman who was assisting him lifted a thick 5′ x 6′ poster board and placed it on a ledge to our right. 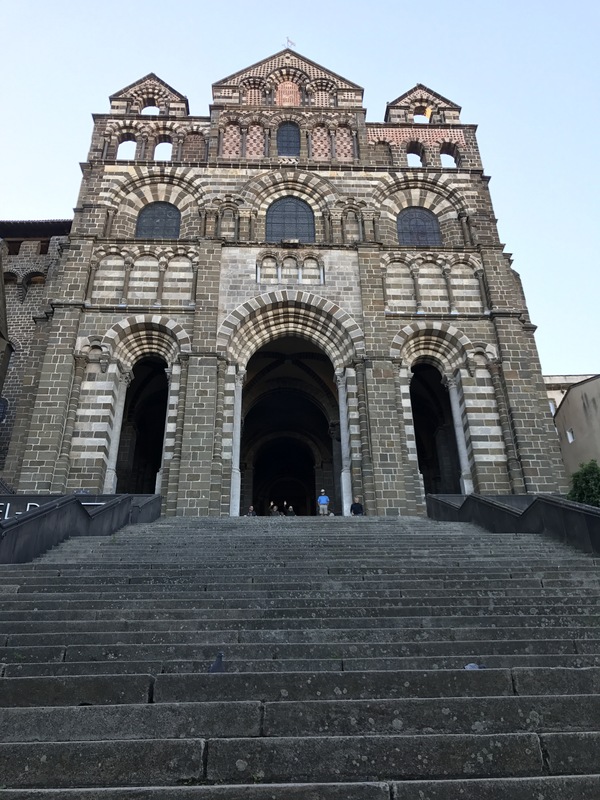 “The man who wrote the prayer called the Magnificant was from Le Puy,” he explained. “We have said this prayer in this cathedral every day for the last 1000 years.” The poster board showed the prayer in four different languages, including French and English. “We will say it now,” he told us. And we all read aloud in French. His female assistant then brought to him two small trays. “We have one of these for everyone,” he said, holding up a small medal. 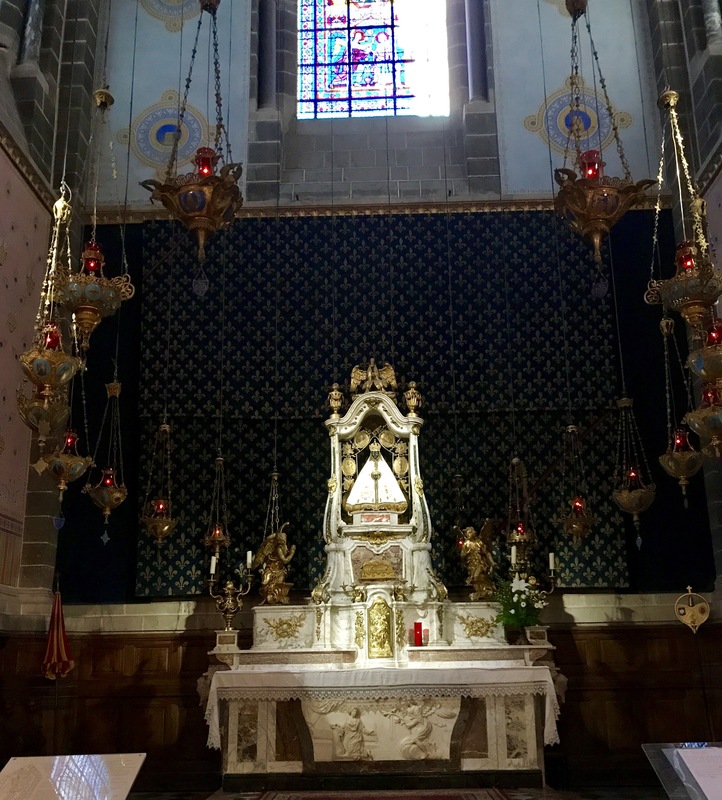 “On one side is the image of Notre Dame de Le Puy.” He turned and pointed to the black Madonna that looked out on the congregation from her perch behind the altar. “On the other side is the coquilles.” “Coquilles” is the French word for the scallop shell–the symbol of the Camino. In the Middle Ages, after pilgrims walked to Santiago, they continued on to the ocean and took a scallop to prove to everyone back home they had made it. 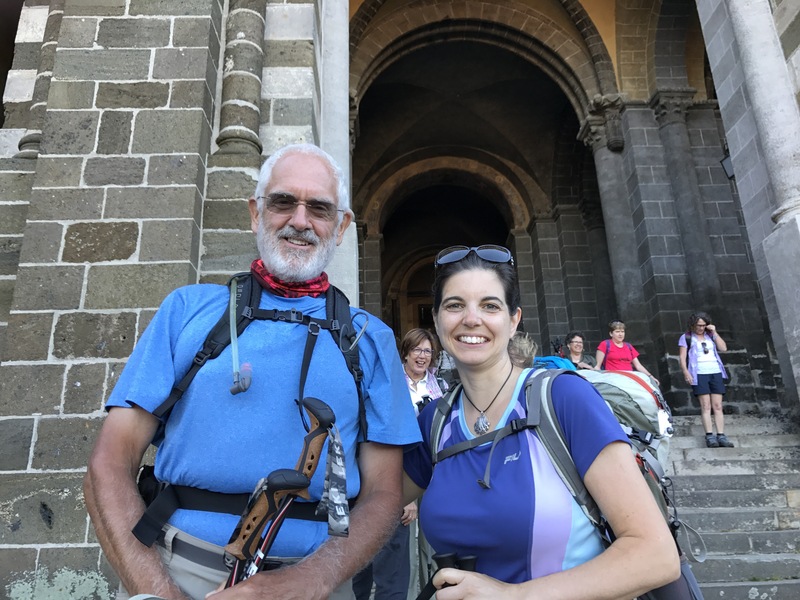 Now pilgrims wear one on their backpacks, and they can be seen all over the Camino–on trail markers, hanging outside houses, on the tables in restaurants, etc. “Back there, in the sacristy,” he said, pointing, “you can get your stamp. And then, you can descend the stairs and exit through the main doors.” Ahhh. Now I understood. They didn’t open the doors until the end of the mass. It was part of the tradition! I went to the sacristy where a nun, in full habit, stood behind the counter of a small gift shop. She stamped my Camino credential in red ink. It was not my first stamp. My first was from the tourist office in Le Puy-en-Velay, and then I had stamps from the historic sites David and I visited the day before. The nun wished me well on my journey. Along the back wall of the room, I saw pilgrims writing on long pieces of paper. I went over to see what they were. It was a form one could fill out to be listed in the register of pilgrims. I filled mine in, and then headed back to the church to grab my pack. David and I descended the stairs. “Wait — I want a picture,” I said, pulling my phone out from its place in the side pocket of my hiking pants. A volunteer we’d met the previous night was there and offered to take our picture together. We stopped to look at the view one last time, and with that, we were off. 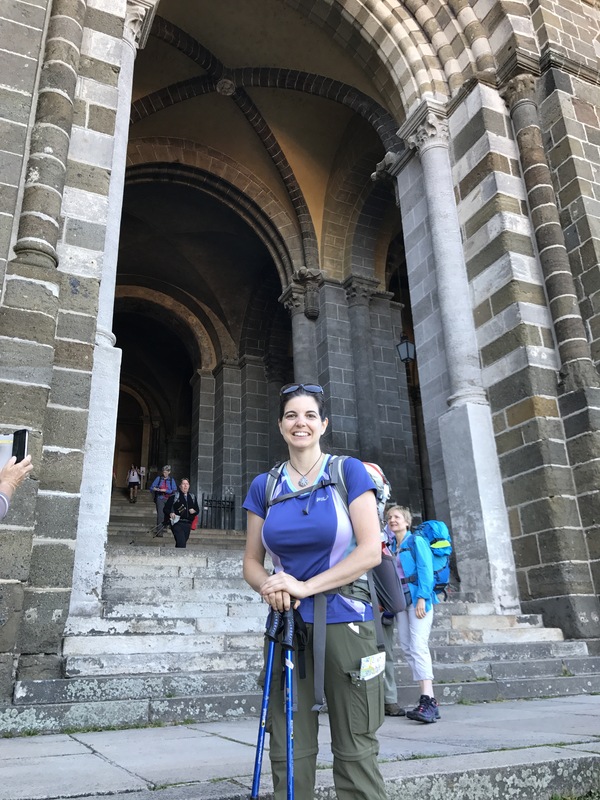 Thank you for sharing your new camino Rebecca. I’m delighted to be able to follow you on this new journey. LOVE the stories, Rebecca! I’d love to be there, but we missed you at CIL this year.